Lying in the northeastern border areas, Heilongjiang has a vast territory, rich produce, many ethnic groups and long border lines. Scattered on its land are boundless forests, immense grasslands, and crisscross rivers and lakes. It has clear----cut seasonal changes and a pleasant climate. Each of its ethnic minorities has a long history and unique customs. Rich in special tourism resources, Heilongjiang is known for its primitiveness, boldness, miraculousness and vastness. In winter, the land of hundreds of miles in Heilongjiang is covered with ice and snow; the towering mountains, dense forests and boundless grasslands are all silvery white; frozen rivers, rimed trees, ice carvings and snow sculpurues can be seen everywhere; and various recreational activities, such as skating,skiing,outdoor swimming, ice fishing and hunting, have special appealing. All these are advantages for developing ice and snow tourism. Heilongjiang Province boasts a number of cool and pleasant tourist attractions, such as Lake Jingbo, the second largest alpine barrier lake in the world; Lake Wudalianchi, one of the third largest cool spa in the world, which was formed by volcanic eruption and where the water is therapeutic and some ice caves remain frozen in summer; Lake Xingkai, a boundary lake between China and Russia; the North Pole night is as bright as daytime; Wusu Town, known as the first Town from the east, where tourists may view both Chinese and Russian landscapes; Zhalong, home to cranes; the towering greater and Lesser Hinggan Mountains; immense forests in the Zhuangguangcai Range of the Wanda Mountains; and the world----renowned primitive Korean pine forests at Wuying. The Heilong,Songhua and Wusuli Rivers run across the province. The boundless forests and scattered rivers and lakes are home to rare animals, birds, fish, such as Northeast tigers, bears, red ----crowned cranes, elks, salmon, sturgeon and huso sturgeon. Hence Heilongjiang is an ideal place for various activities in hot summer such as wildlife appreciation, hunting, bild----watching ,drifting, horse riding,etc. With a border line of over 3,000 kilometers, Heilongjiang links with Russia by both land and water. Now Heilongjiang has opened 24 ports of entry. As an important thoroughfare from Asia and the pacific Region to Russia and the European Continent, Heilongjiang has the advantage of developing border river tours, border area bours and transnational tours. Viewing the primitive wasteland, vast grasslands, the Daqing Oilfield and boundless wetland in Heilongjiang Province, tourists will feel relaxed and happy. They will also be attracted by a large number of modrn industrial groups. The spirit of the Great Northern Wilderness, the "Iron Man Spirit" and the "Daqing Spirit"has cultivated the Chinese people generation by generation, and has enjoyed a high reputation both at home and abroad. such spirits are of great development value. Since ancient times, ethnic minorities have labored, lived and multiplied on the land of Heilongjiang ;and the archaeological siter of 42,000 years old have been discovered. As the birthplace of the Liao (916--1125), Kin (1115--1234)and Qing (1644--1911)dynasties, it embraces many historical sites, such as the cave where the people in the Northern Wei Dynasty (386--534) offered a sacrifice to the god; the ruins of Longquanshangjingfu, capital of the Bohai State in the Tang Dynasty (618--907);Wuguocheng Town where Emperor Hui and Emperor Qin of the Song Dynasty(950--1279) once lived in exile; and the ruins of the Huiningfu, capital of the Kin Dynasty. Now Jinyuan culture has become a new research field attracting the world attention. One who is engaged in the study of the culture of ethnic minorities in north China must visit the Hezhens mainly living on fishing, the Oroqens on hunting and the Daurs on livestock. Situated in the far northeastern corner of China on the border with Russia, Heilongjiang has a sub-arctic climate where temperatures can drop to -40C during the long winter months. The name Heilongjiang, meaning Black Dragon River, refers to the Russian-named Amur River, the border between the two countries and long an area of dispute. In 1896 the Russians built a railway link from Vladivostok down to the port at Dalian, passing through what was then the nondescript fishing town of Harbin. The town's population swelled in the early part of the 20th century, particularly with the White Russian exodus following the Bolshevik Revolution of 1917. In 1932 Japanese forces invaded Manchuria, who held Harbin until the end of World War Two, when the Russian army took control. Only after Chiang Kai Shek and Stalin came to an agreement did the Soviet soldiers withdraw, taking with them most of the city's industrial plant. The strong Russian influence on the province is illustrated by the beautiful interesting European-style architecture to be found in Harbin. Since the fall of the Soviet Union in 1991, many Russians have started trading - mainly clothing and furs - over the border through Harbin, and the city still boasts several Russian restaurants and buildings topped by cupolas. The minority Oroqen, a nomadic people native to Heilongjiang, survive mainly by hunting reindeer in the province's vast forests. They live off the reindeer meat and furs, and sell on reindeer parts to the Chinese as ingredients for Chinese Traditional Medicine. The Oroqen traditionally practise a Shamanist religion but are steadily being assimilated into Han culture. 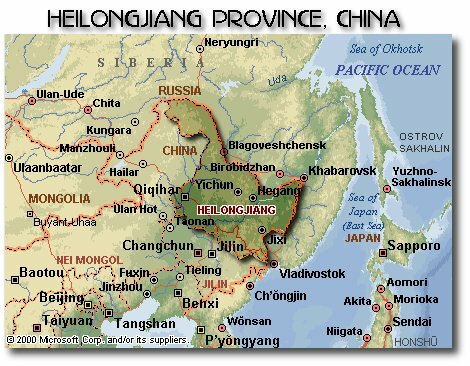 Famous for its fertile black soil, Heilongjiang is a major producer of grain, as well as soya beans and potatoes. Extensive grazing lands make it the largest producer of milk in the country. Harbin's Ice Lantern Festival in January, with garishly illuminated (though still spectacular) ice sculptures. Siberia Tiger Park on Sun Island (not for the faint-hearted). Jingbo Lake: near Mudanjiang with a beautiful lake, islands and well served with hotels. Good for fishing and walking. Yabuli ski resort: site of the 1996 Asian Winter Games providing both downhill and cross-country skiing. Zhalong Nature Reserve near Qiqihar with 236 bird species, notably the Siberian Crane. Harbin airport is 46km southwest of the city. It offers flights to the Russian cities of Chita (twice weekly, 1 hour 30 minutes) and Kharbarovsk (daily, 4 hours 30 minutes) as well as Beijing (nine daily, 2 hours), Shenyang, Dalian, Shanghai and Guangzhou. Check TravelinChina's airline information for details. Harbin is on the Trans-Siberian Railway line, with weekly trains reaching Moscow in six days (take a good book), Qiqihar in four hours (two daily) and Jilin in two hours (four daily).